We always hear the saying, “Every little bit helps.” Get your green on this year for Easter and take a few steps toward a more sustainable holiday! Whether you’re interested in scaling back on buying items for the holidays or you’d like to teach your kids about how to be a bit more eco-friendly, we’ve got some ideas for you! You don’t need to go all-out to find ways to be more sustainable with your celebrations. Start out with a few small steps and you might be surprised where they lead you! Some Easter egg coloring kits contain chemicals you might not know much about. Why not make your own coloring kit using plant-based dyes? We suggest using spinach, beets, turmeric, paprika, blueberries and red cabbage to create pretty spring colors for your eggs. Take a peek at these SheKnows egg-decorating tips and review these ideas for naturallly dying your Easter eggs. If you’re going to decorate your table setting, try something a little different than buying flowers or other paper or plastic decorations: Use spring vegetables like whole radishes and carrots (tops included) or asparagus and green onions as a feature for your napkin ring. Place the vegetable on top of your napkin and use twine or heavy string to tie it to the napkin. When dinner is served, pass around a basket to collect the veggies and save them for a spring soup or salad! Also consider using flowers and greenery from your garden to decorate your space (think lemons in clear vases, too), and get your kids to help make colorful place cards for the table setting. Easter is one of the biggest holidays for candy, and sometimes, those chocolate Easter bunnies are wrapped up tight as a drum in a lot of plastic and cardboard. Seek out candy options that don’t include lots of extra packaging that will simply get tossed. Look for Easter bunnies that are wrapped in foil only (or minimal cardboard), or candy that comes in bulk packaging. Consider making your own goodies like traditional marshmallow Rice Krispies treats. Do you find that each year you’ve collected a bunch of baskets, only to toss them when the day is over? 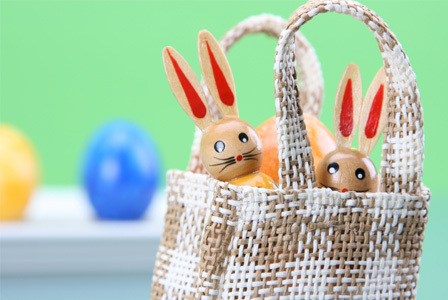 Instead of running out to buy a new plastic Easter basket each year, buy a basket made of natural materials and commit to using it each year. Try searching for baskets at yard sales or thrift stores. Your kids will come to expect their special basket each year, making it part of a holiday tradition. If you’re crafty, make your baskets from fabric or recycled items, personalized for each child, for an annual tradition. Check out some of these crafty SheKnows Easter basket ideas. What’s Easter without the candy? Sure, you want to provide some sweets in that basket, but you don’t have to go overboard in the candy department. Pick a few candies made with organic ingredients, then think about different things you can include in your kids’ baskets, like homemade treats. Follow these step-by-step SheKnows instructions to make your own gummy candy. Also, think about adding a book to the basket or another special gift with meaning. 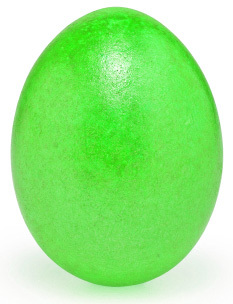 To find different varieties of organic and fair-trade Easter candy, visit the Natural Candy Store, which also offers marshmallow eggs, chocolates and gummy candy that meet special dietary needs (including corn-syrup-free, peanut-free and gluten-free). Holidays are all about tradition! What better time than spring to plant the seeds of a lasting tradition with your family. 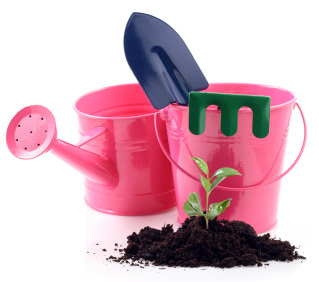 Get together to start your own garden or make a dedicated effort to plant a tree each year at this time. Review these SheKnows tips to build a raised-bed garden. Talk about growing with your family! Your holiday celebrations can be fun, festive and with a few simple steps, more sustainable and green!